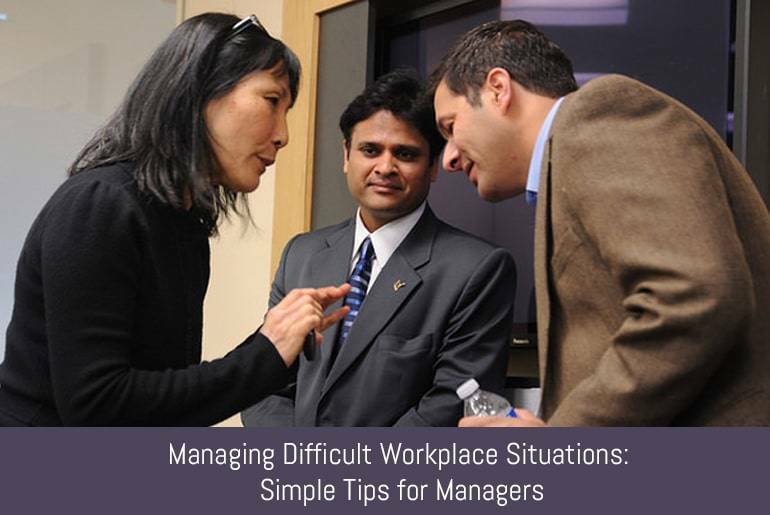 Some employees make managers’ life easy, while others are more difficult to handle. If you want to learn how to manage employee requests and demands in a democratic way, without harming relationships in the office, read the below tips. If your employees turn up late regularly, and fail to give you an explanation, you should avoid getting angry. Always acknowledge the lateness, and make sure that it is documented. Don’t confront your employees directly in front of other people, but ask them for a meeting. Sit down with them and ask about the reason for being late. Show that you are open to finding a solution together, and make the rules clear. It is possible that your employee is having issues with transport, or has family problems, therefore, a temporary change in shifts could be a solution. If your employees complain during performance reviews about their immediate colleagues or supervisors, never get directly involved. Instead, remain calm, and arrange a meeting where the other party can be present as well. Instead of listening to one side of the story, you should be trying to get everyone together holding a mediation meeting. Thank the employee for bringing the issue up, and trusting you. Make it clear that you want to find a solution that is suitable for the company’s management, as well as employees. Don’t promise that you will talk to the other party, as this will be an indication that you are siding with the person who made the complaint. One of the most difficult issues at the workplace is dealing with a time off request. You should not look like you are making allowances for some employees, while being inflexible with others. To justify your decisions, you need to have a time off request policy in place. Make it clear that all employees need to go through the right channels, and you deal with requests on a first come first served basis. This means that the person who hands in their written form has priority over those who submit theirs after. Create a policy for dealing with time off requests, so all managers can follow the same guidelines, and your company will not be accused of favoritism. Long term sickness of your employees could have several reasons. In some cases, employees are dealing with mental health issues, while others have already decided to seek another job, and use sickness as an excuse to attend interviews. Don’t automatically assume that your employees are trying to get out of work. Sit down with them, and ask how you can help. If your company offers an in-house or outside counseling service, or there is a mentor available, offer this. If your employee is off work for a long period of time, you need to make sure that they are fit to return to work when they do. While doctors keep patient information confidential, you can still learn more about the problems from colleagues and the employee himself. Disability is taken seriously by all employers these days. If you receive a workplace adjustment request from an employee, which you don’t find justified, don’t assume that they are trying to make life harder for you. Instead, ask about their problems and the details of their disability, and get them to provide a note from a physician. If the adjustment is simply related to seats, or back support, you are not likely to spend a lot of money on the adjustments, and will not have to look into the request. However, if you need to create a separate bathroom at the workplace due to the employee’s disability, you might want to let them know that you need to justify the expense, and need further information. Offering flexible working is one of the ways of keeping your employees happy. In most cases, you should not ask for a reason for the flexible working hours request, and allow your workers to take time off. However, you also need to take into consideration the interest of the company. Before you create a flexible working hours policy, you will need to hold discussions with employee representatives and negotiate. While some people might want to pay back time after 6 p.m., you might not be able to accommodate their request, as there is no supervision and security on site after this time. You will need to ensure that your business doesn’t suffer, which means that the busy periods are covered. Workplace conflicts are sensitive issues. As an employer, it is your responsibility to deal with every harassment claim efficiently, and investigate all the cases, otherwise, you will be prosecuted if the employee files a claim in the court. The first step is to create an inclusion and internal communication policy and train all employees on how to deal with, report, and respond to inappropriate behavior at the workplace. Once your policy is clearly communicated, you need to create a confidential channel to be used by your workers to report their concerns. If an employee has too many complaints against other colleagues, it is likely that they are either targeted based on their diversity status, or are unable to fit in. Either way, you have to investigate all cases, offer mediation, and come to a resolution, documenting every step. There comes a time in every manager’s career when they need to deal with an increased number of employee complaints, conflicts, and requests. If you would like to manage every situation effectively, you have to first cover your bases and have clear company policies drawn up. Never take sides, or make promises without listening to the other party. Seek advice from employee rights experts and union representatives, to make sure you are able to manage difficult situations. You need to put your judgments aside, and complete a situational assessment based on the facts. Try to be understanding, supportive, but at the same time consider the interest of the company first.